We carry large stocks of pressure treated green fencing, as well as stocking a wide range of fixings, gate furniture and fence paints. Typical stock sizes are as follows. We can also supply machine rounded posts and large size gate posts. We carry large stocks of ‘Arbordeck’ deck boards and accessories, machined from top quality softwoods and pressure treated offering a complete decking system which includes reversible deck boards, joists and a wide choice of balustrade styles. 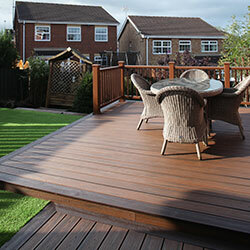 A well fitted deck can bring into use a difficult or inaccessible garden area, such as a sloping area. Fitting a relatively simple deck to this area opens it up for outdoor dining and entertaining. 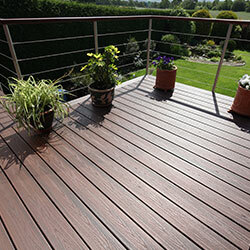 So, whether you are looking for a practical and attractive solution for a balcony or a cost- effective alternative to a conventional lawn, decking can provide a year round extension to your living space and, with some cleaning and oiling, will be as good in years to come as the day it was installed. We offer a full design and fitting service allowing you to turn any garden whether it is large or small into a stylish outdoor space for you to relax in or entertain friends. Clever changes in board direction, mixing smooth and grooved, the addition of balustrade or adding more than one deck level creates individual style statements. 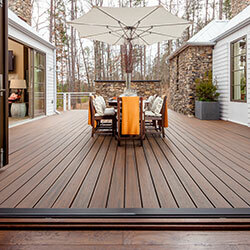 We also have Hardwood decking and non-slip decking as well as a range of decking finishes and hardware. 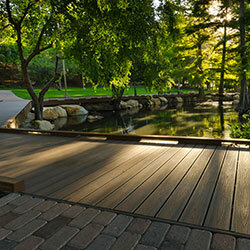 Manufactured from 95% recycled material including plastic packaging, reclaimed wood and sawdust, ‘Trex’ composite decking produces one of the most environmentally focused and weather-resistant decking products on the market. Easily fitted to joists, composite decking is becoming a popular alternative to timber decking. With only an occasional clean with soap and water, ‘Trex offers a low maintenance, high quality product for both commercial and residential properties. It is fade resistant, will not rot or split and never needs oiling or painting. Available in 6 colours with a deep wood grain effect there is something to suit any garden design.